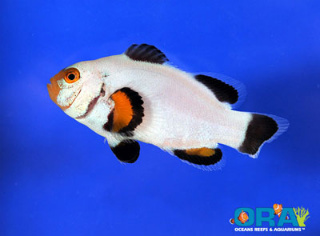 There’s an air of anticipation at ORA this week as we are introducing our newest designer clownfish – The Platinum Percula. While watching these fish grow over the last few months it was amazing to watch their development. One of the pleasures of selective breeding is the serendipity of an unexpected result and the subsequent unfolding of traits not predicted. That was the case with this latest offering, and the excitement of watching the growth and development of a new strain was difficult to contain. They say that the one thing that never changes is that everything does change, and so it seems that applies to clownfish too. We hope you are all pleased by our latest effort, check out the photos below. 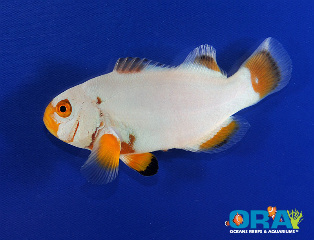 The first photo shows the coloration of the fish we will be shipping, the second shows a fish that is a few months older with black fins.